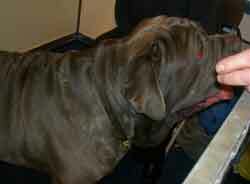 The Neapolitan Mastiff is a large, ancient breed of dog that can be traced back to about 100 BC. This dog is a massive, awe-inspiring dog bred often used as a guard and defender of owner and property. The Neapolitan Mastiff is descendant of the Molussus, the mammoth war dogs of the Middle East, and was frequently used in the Roman arenas to be pitted against lions, bears, and gladiators for entertainment. As a dog of war, he fought alongside the Roman legions, and in this was he was spread throughout Europe. Eventually the descendants of the Roman Molossian splintered into several different Mastiff breeds: English Mastiff, Dogue de Bordeaux, Spanish Mastiff, St. Bernard, and Rottweiler. In the 1940s, this breed was rediscovered near Naples in Italy in 1947, and is now beginning to make a comeback. He is characterized by loose skin over his entire body; abundant, hanging wrinkles and folds on the head; and a voluminous dewlap. The Neapolitan has a characteristic beastial appearance, with a huge head and imposing size and attitude.